A beautiful night in southern Iceland, and I knew exactly what shot I wanted: the Northern Lights, the glory of the Aurora, rising over the incredibly photogenic Verturhorn Mountain. With wind whipping across the tidal plain and black sand everywhere, it was a struggle to get set up. But with the glow of the Lights rising from the side of the mountain, I knew I had the shot if I could just execute properly! 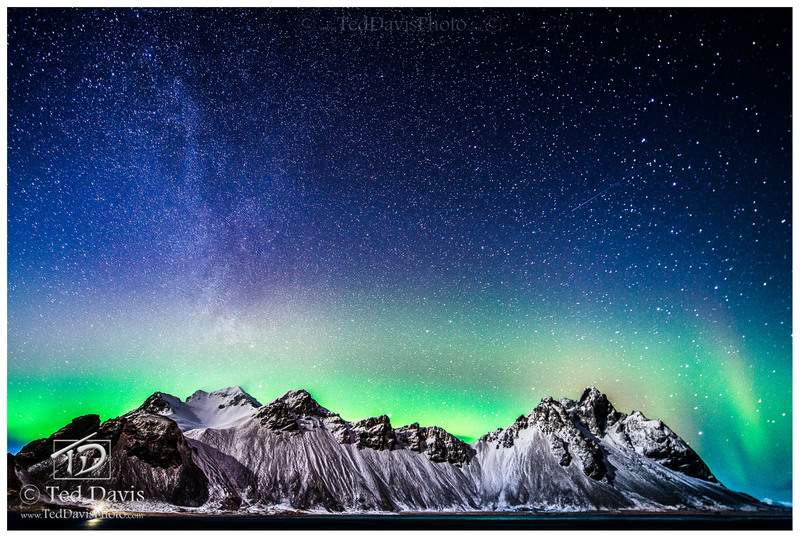 Then, the last remaining clouds blew away and the glory of the Milky Way was revealed towering over the mountains. I had the shot, and it was even more surreal and beautiful than I could have imagined. Photo © copyright by Ted Davis.